Water Valley & Pelican Lakes’ annual “A Water Valley Christmas” is back! The holiday event is open to the public and well be held on four Saturdays in December. 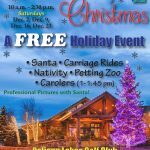 From 10 a.m. to 2:30 p.m. on Dec. 2, Dec. 9, Dec. 16 and Dec. 23 Pelican Lakes Golf Club will host a petting zoo, a nativity scene, carriage rides, carolers (1-1:45 p.m.) and of course, Santa! For more information, call 970-674-1100.